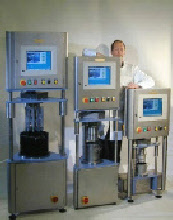 The Rheomixer is a device that can mix paste/mortar and measures its rheology in one continuous operation in a closed container. The device measures the torque at a certain rotation speed. 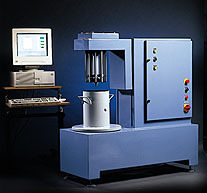 The parameters obtained by the measurement are the (Bingham parameters) G-yield value and the H-viscosity, corresponding to yield stress (Pa) and plastic viscosity (Pa s). Measurements with same mix in a coaxial cylinder viscometer showed a good correlation between both devices. Results obtained by ConTec Rheomixer are based on the Bingham model. For both mixing and measuring, the same impeller is used. The impeller during this study is equipped with two types of blades, a) mixing blades and b) measuring blades. The mixing blades are attached directly to the axis of the impeller. These blades are optimized for agitating the mortar/paste during the mixing process. The measuring blades are connected to the axis of the impeller by steel rods. These measuring blades have a triangle shaped cross section optimized for the measurement of the mortar/paste. Due to the shape of the measuring blades, the generation of liquid to the shearing zone is reduced to a minimum. An example profile of the mixing- and measuring period of Rheomixer. At the end of the mixing procedure the rheological test is conducted. Measurement at three fixed times (after 6, 13 and 15 min) are performed. The profile can be divided into 3 mixing regimes and 3 measuring regimes. During first 30s the mixing profile consists of three 10s cycles of forward and reverse rotations of the impeller at a speed of +/- 1.5 rps. In the following 120s the amplitude of the cycles are increased to 3rps and the cycles time is decreased to 2s. Thereafter a constant speed of 1.5 rps is maintained over the next 55 seconds. After the mixing, the mortar is at rest (from 205 to 255s) followed by the rheological measurement at 6, 13 and 15 minutes.